1) You can now import/export maps from images. 4) Removed auto-complete until I can make it function correctly. Digging up the ol' feature request/bug report list from the 2013 thread. I can now cross off the prettifying feature! But I come bearing new items, as well. ▪ Changing token files a couple times triggers an exception citing that the "Maximum count of Styles is exceeded" and the style system fails. ▪ "Changing" to the token file that's currently in use triggers an exception citing that a "Parameter is not valid" and the editor is overlaid with a red X. ▪ Switching token files results in the new token file parsing the text produced by the previous tokenization, which isn't ideal when two token files have separate tokenizations of one token and the tokenization is lost (e.g. AxeTokens.xml, which renames a number of tokens). ▪ Comments are underlined even when minTokenLength="0". ▪ Tags such as comment and site do not work when a token has alt strings specified. ▪ Supporting a full tree structure for the token catalog. ▪ Displaying command/group descriptions as html to allow for token xml files to provide more detailed/better formatted information. New feature request: nested definition resolution. Big list of stuff incoming! ▪ There's no redo capability. ▪ It would be nice if undo and redo were visible in the Edit menu. ▪ Commented lines contribute a byte to the live update byte counter. ▪ Multiple preprocessor definitions cannot have the same value. An error message complains that "An item with the same key has already been added," even though they certainly have different keys but the same value, which should be fine. ▪ A generalization of the "prettify code as you type" feature: when a group of characters is detected as a token, replace them with the token's primary representation. ▪ When opening program files, automatic injection of escape characters into sequences of tokens that would be (erroneously) re-tokenized as a single, larger token. ▪ Replace might help to fill out the Edit menu. I'm also going to quote my old posts in this thread so I don't forget about (and you don't forget about!) those feature requests. Green means already implemented. ▪ A shortcut to escape the last multi-character token parsed. Perhaps Shift+Backspace or Alt+Backspace. ▪ A way to customize the escape character. Probably either via the settings file or the tokens XML file. ▪ An option to cause the escape character to be skipped over when moving the cursor, lumped with the next character when backspacing/deleting, etc. This would primarily be useful if the two features above are implemented and a zero-width space is used as the escape character, in which case the textual representation of escapes could be entirely hidden (I like pretty code). 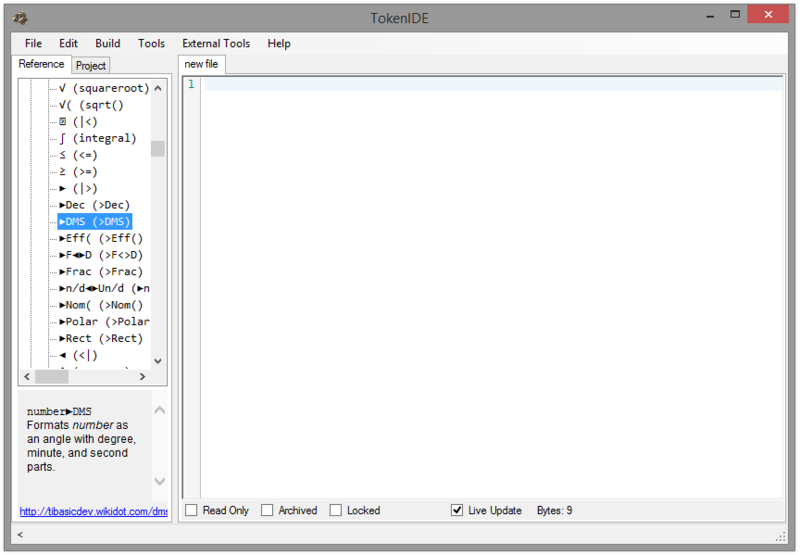 One could determine if a group of characters is a token by the presence of syntax highlighting or the grouping underline. ▪ A way to toggle representation of a group of characters as a token or individual characters. This would also primarily be useful if the features above are implemented and a zero-width space is used as the escape character, as this would allow one to escape/unescape a group of characters without having to directly interact with the escape character. This could possibly be implemented as a key shortcut, like Ctrl+T or Alt+T, that affects the characters around the cursor, or perhaps even by providing the capability in a context menu when right-clicking over the target group of characters? ▪Prettifying of code as you type! Thanks for reposting that, Runer; makes it easier for me to track. If your pictures uses more the 32 colors, it'll reposterize it using the first 32 colors it comes across (but will prompt you first). Also, if you use fewer that 32 colors, it just sets the rest of the palette black. I'm not sure if that's right--waiting for tr1p to confirm. Turns out you want to leave out minTokenLength entirely. Removed from default tokens files for styles where we fon't want underlines. Can you elaborate on this a little more? What exactly would you like to see? EDIT: This doesn't work right under Mono. I will be taking it out and replacing it with something else in the next release. I may not stick with HTML. 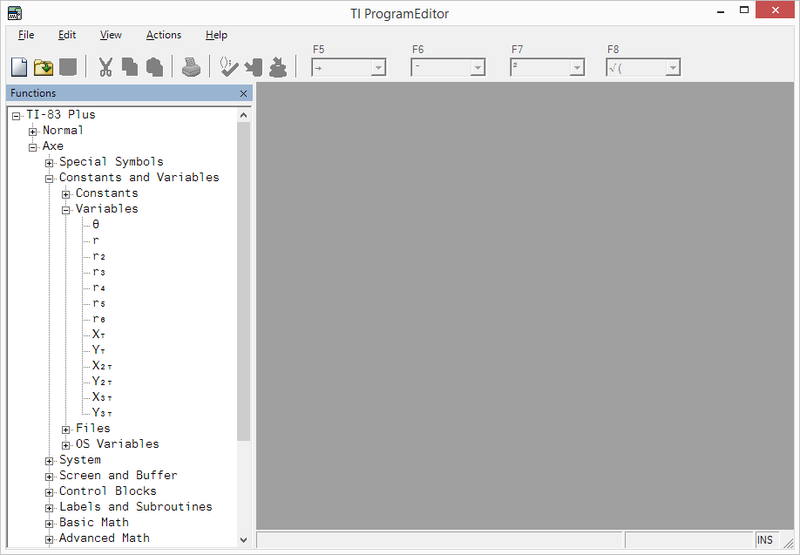 As a side note, it's also somewhat nice that TI Program Editor lets you specify the order tokens appear in the catalog. 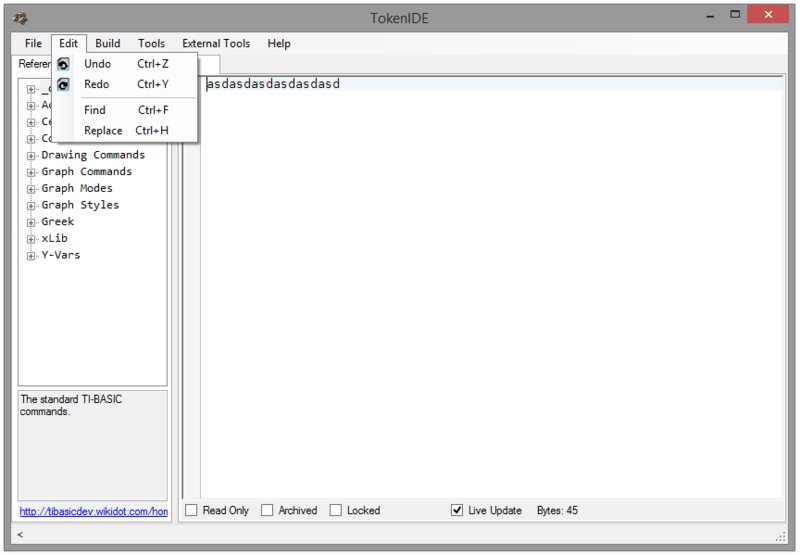 It handles this by making the token catalog a completely separate file, but that might not be necessary. Merth, the map editing and importing features will definitively be very handy. Thanks a lot. I'll have to try them later. -The mousewheel changes the map width. This could be seriously problematic since most people are used to the mousewheel scrolling up/down, so they could end up losing progress at any moment by accidental resize. -Maps are not imported properly. For example, if I import the map above from a PNG, plenty of tiles remain white. 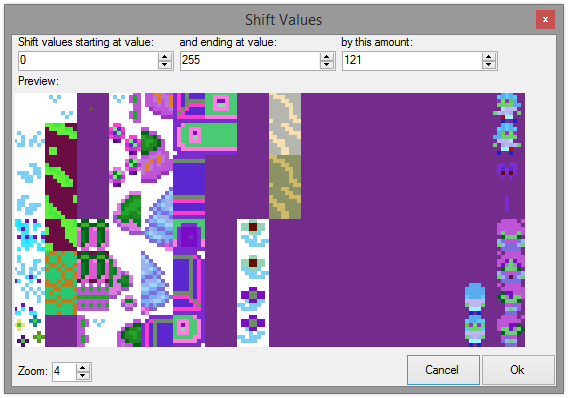 It would also be nice if we could automatically generate tilesets from the picture, removing duplicates in the process, like Mappy can do. If the tiles are already present in the tileset, it would just not import them. In the image editor, it would be useful if the current image isn't used to change the picture. Resize the PNG. The PNGs you gave me were 2x, so just resize by 50%. Agreed. I'm planning on adding that. I'm not sure what else it would do... The whole point of changing the palette is to change the palette of the current image. Making it do something else would defeat the purpose. Did that work for you, then? Woo! Thanks for testing it, tr1p I'm glad it works correctly. Useful if you're adding or removing tiles from the spritesheet and want to redo the map. For convenience, the tile in the left-click spot is the start and the tile int he right click spot in the end when you start the form. Awesome. This was a serious issue in Mappy because if I needed to add an extra floor tile at the beginning, I had to redo the entire map from scratch due to wrong tiles being used for all solid tiles above that one. Mappy supports the same feature I think, but it doesn't work at all. There's also no reason I can't include more robust sprite-editing into the map editor itself--both on an image level and a sprite-specific level. 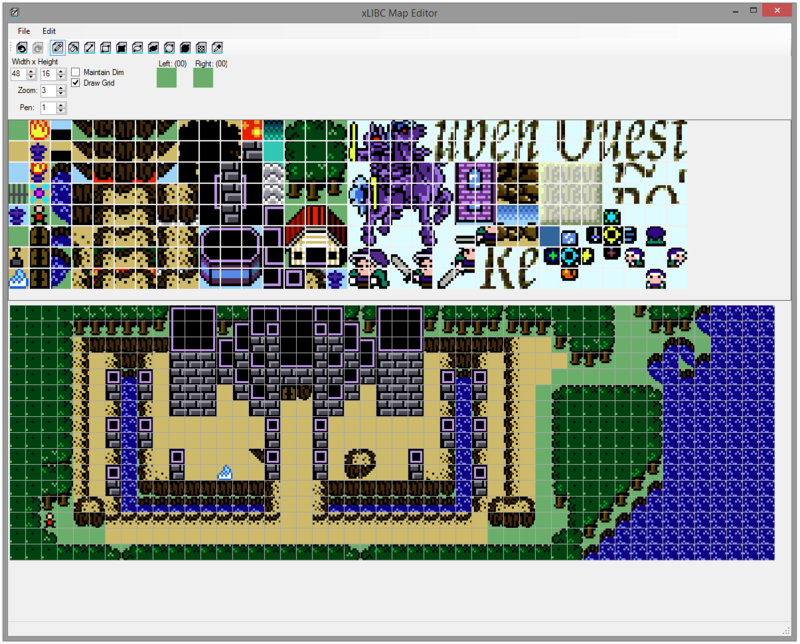 Including inserting sprites automatically, and shifting the tiles of the currently map. Yeah this would be indeed nice. Sometimes we realize we have missing tiles and might want to immeditately insert one or copy/paste an existing one then modify it. 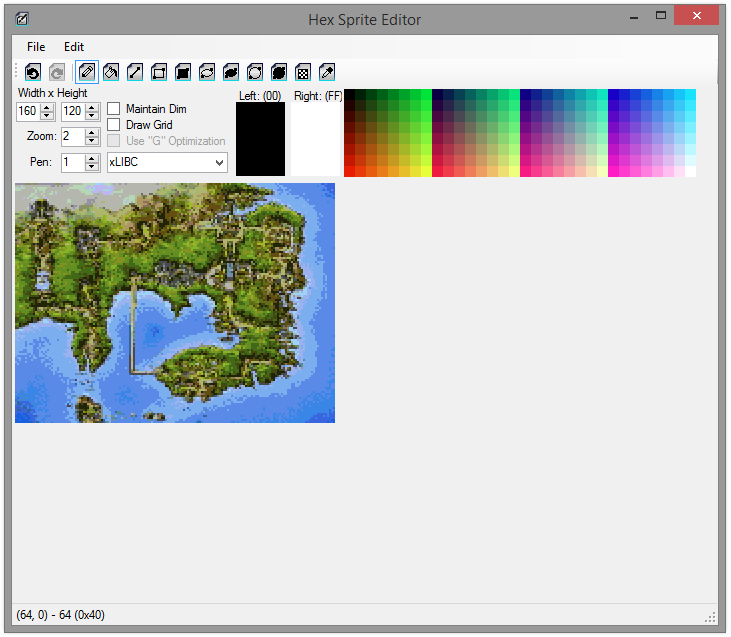 EDIT: Another cool feature would be if TokenIDE image/tile/sprite editors allowed you to preview a sprite, map or image at a different "hue". I am putting hue in quotes here since it's not really hue that I mean, but basically, it would be cool if we could change the color palette offset of an entire tile, group of tile or image area. For example, -1 would decrease all pixel colors by 1 based on the xLIBC color palette (then loop back if it goes outside the 0-255 range). It would be handy for previewing how our sprites or maps would look like on calc after using the upcoming color palette offset command in xLIB as demonstrated by tr1p1ea's pumpkin screenshot. 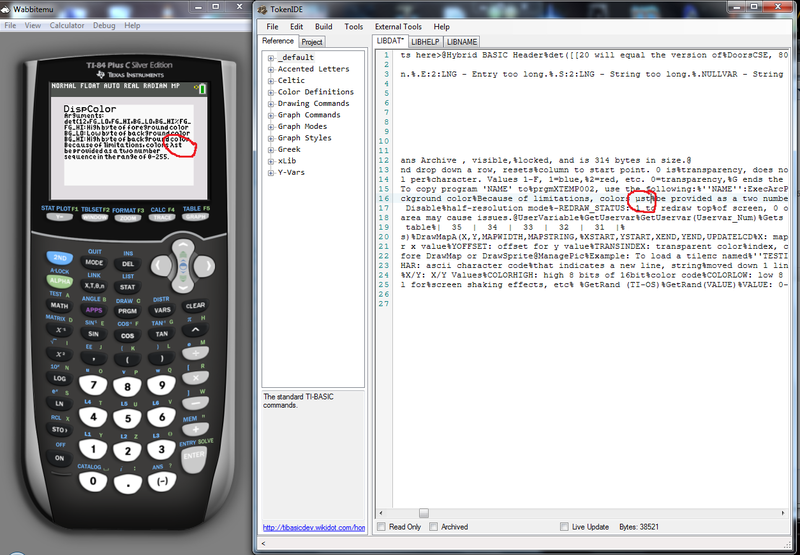 Right now ►DMS in TI-84+CSE.xml is the only one that has any fancy formatting like that. Using Markdown is unlikely to change. The only big difference between the actual Markdown standard and the way I handle it is that a single \n will result in a newline in the output. Another cool feature would be if TokenIDE image/tile/sprite editors allowed you to preview a sprite, map or image at a different "hue". I am putting hue in quotes here since it's not really hue that I mean, but basically, it would be cool if we could change the color palette offset of an entire tile, group of tile or image area. For example, -1 would decrease all pixel colors by 1 based on the xLIBC color palette (then loop back if it goes outside the 0-255 range). It would be handy for previewing how our sprites or maps would look like on calc after using the upcoming color palette offset command in xLIB as demonstrated by tr1p1ea's pumpkin screenshot. What do you mean will it work? That's not a feature of this program. Just look to the right of the cursor. There are 129 users online: 3 members and 126 guests. © Copyright 2000-2019 Cemetech & Christopher Mitchell :: Page Execution Time: 0.138967 seconds.